Finding a safe and delicious snack for babies can be a testing task. Getting the right mix of taste, texture and nutrition is a vital part of developing healthy eating habits in a baby’s lifestyle. Introducing Baby Mum-Mum; a range of delicious, nutritious rice rusks which have been by loved by Australian babies for over a decade. Full of wholesome ingredients, they feature no artificial colours, flavours or preservatives. Baby Mum-Mum Rice Rusks are ideal for allergy-prone, ingredient-intolerant and even vegan babies as they are free from top common allergens including gluten, egg, nut and dairy. Easy to digest, they are baked and individually wrapped; ideal for mums on-the-go. Our FIRST rice rusk range features no added salt and is flavoured with fruit juice. Baby Mum-Mum Rice Rusks are the perfect snack to promote the co-ordination needed for chewing. They are a comfortable shape to hold and best of all, they are mess free. 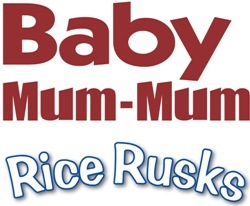 Available in original, apple, banana, vegetable and organic carrot and organic blueberry & carrot flavours, Baby Mum-Mum Rice Rusks are an ideal snack for growing babies.